Where is Tick Paralysis Prevalent? Tick Paralysis is caused by over 40 species of ticks worldwide (five in North America, including the deer tick) and can occur in almost any region where ticks are found. It has killed thousands of animals, mainly cows and sheep, in other parts of the world. Although tick paralysis is of concern in domestic animals and livestock in the United States as well, human cases are rare and usually occur in children under the age of 10. Tick paralysis occurs when an engorged and gravid (egg-laden) female tick produces a neurotoxin in its salivary glands and transmits it to its host during feeding. Experiments have indicated that the greatest amount of toxin is produced between the fifth and seventh day of attachment (often initiating or increasing the severity of symptoms), although the timing may vary depending on the species of tick. 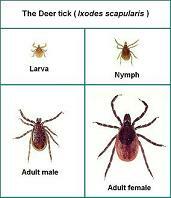 Ticks that cause tick paralysis are found in almost every region of the world. In the United States, most reported cases have occurred in the Rocky Mountain states, the Pacific Northwest and parts of the South. The five North American species of ticks thought to cause tick paralysis are widely distributed throughout the United States; therefore, the potential for contact with such ticks exists in every state. As with all other tick-borne diseases, the most effective precautions against tick paralysis are to avoid walking through or brushing against vegetation and to perform daily self-examinations for ticks – even in the fall and winter months. If you live in regions with higher incidences of tick paralysis (see Where is Tick Paralysis Prevalent? above) and spend a lot of time outdoors, wearing long pants, long-sleeved shirts, socks and enclosed shoes may reduce a tick’s chances of contacting your skin. Insect repellents containing the active ingredient DEET can be applied to the skin (be sure to strictly follow the manufacturer’s directions) or to the clothes, while Permethrin can only be used on clothing. Hikers should stay on cleared, well-worn trails to avoid contact with vegetation. Most importantly, no matter where you live, inspect yourself thoroughly after returning from any outing, even if you go no further than the front lawn. Prompt removal of ticks, preferably before they’ve had a chance to become engorged, will go a long way in preventing tick paralysis and other tick-borne diseases.